The global warming thing is rapidly falling apart, but a lot of loud and/or powerful people owe their careers to it. So with each passing month the contrast grows starker between the evidence of the real world and the program of the zealots. 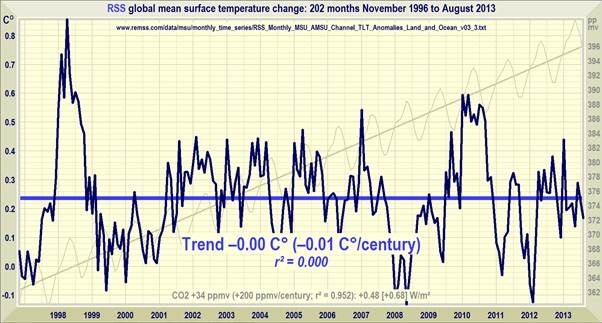 The global temperature as measured by UAH for August came in at +0.16 deg C, remaining well below the peak of +.68 deg C reached way back in 1998, and showing no signs of increasing. Do you notice that you haven't heard much lately about the crisis of Arctic sea ice? That's because Arctic sea ice has had a record increase this year. 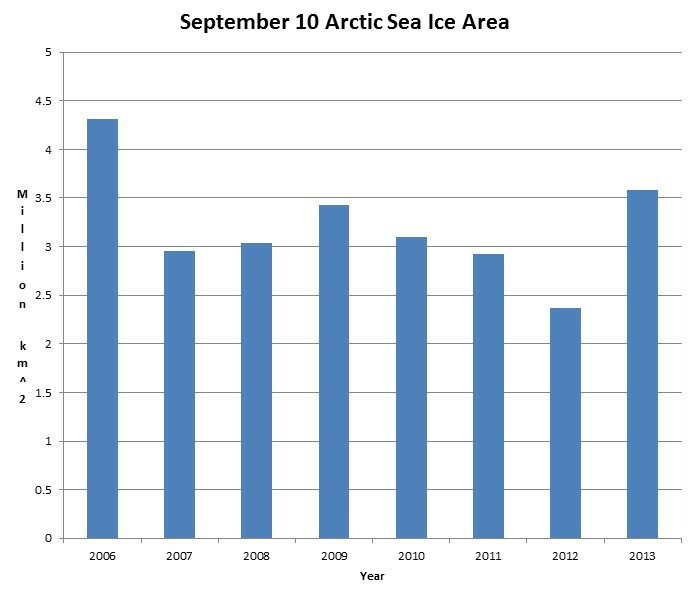 September is the month of lowest sea ice in the Arctic, so when people raise a scare about an "ice-free" Arctic, they are talking about this time of year. Last year the September minimum was under 2.5 million sq.km., but this year it's back over 3.5 million sq.km. Source here. Perhaps it is the Antarctic sea ice that is shrinking? No, yesterday that actually set a record high for this date, and it has set some 42 daily records this year. The front page of the Wall Street Journal and many other sources today report on new regulations from the EPA that will effectively ban all new construction of coal-fired power plants in the United States. This report at Town Hall calls the new rules a "De Facto Ban" on coal power plants. Do they even know that China continues to build new coal power plants at a rate of about one a week? Let alone that the whole global warming thing isn't happening? And check out 350.org, energetically organizing a movement at hundreds of college campuses seeking divestment of ownership of companies in the fossil fuel business. I'll bet your college has a branch! It's run, of course, by rich kids with nice cars who have never gone a day in their lives without electricity.